Is there anything better than hot chippies?? I don’t think so. They would have to be my one weakness. I seriously LOVE THEM! So, of course I wanted to find a way to eat them and make them as nourishing as possible. The best thing about making them at home, is you can control the quality and quantity of the salt and oil. YAY!! So you can use all the good stuff and reap all the benefits of sweet potatoes. I love both white potatoes and sweet potatoes but the seasonings work so well with sweet potatoes, I guarantee you fall in love! 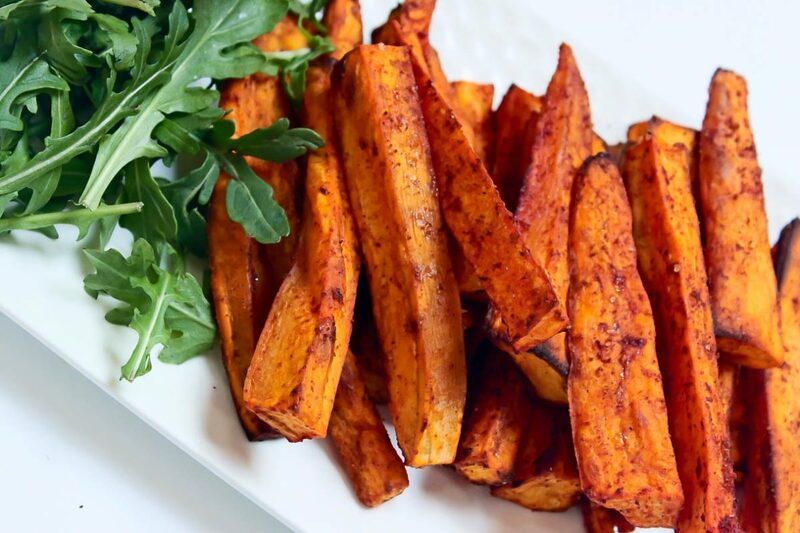 Sweet Potatoes are naturally lower in calories, low on the glycemic index (which means that they won’t spike your blood sugar, they are also high in Vitamin A, C, Fibre & Potassium WOOO!! Not to toot my own horn but I really have nailed the crispiness… Enjoy lovelies!! Peel sweet potato and cut into thick slices/wedges. In a mixing bowl place the sweet potato, all seasoning ingredients, 1 pinch of salt and 1 tbsp. Olive Oil. Use hands to cover the potatoes in seasoning. Rub the seasoning in to the potatoes. Lay baking paper over baking tray. Evenly spread sweet potatoes. Drizzle with the remainder 1 tbsp. Olive Oil and 1 pinch of salt. Place in oven for approx. 50-55minutes, or until desired. Note: if you slice the chips thinly they will take approx. 40-45mins. Then Enjoy your delicious crispy Sweet Potato Chips!